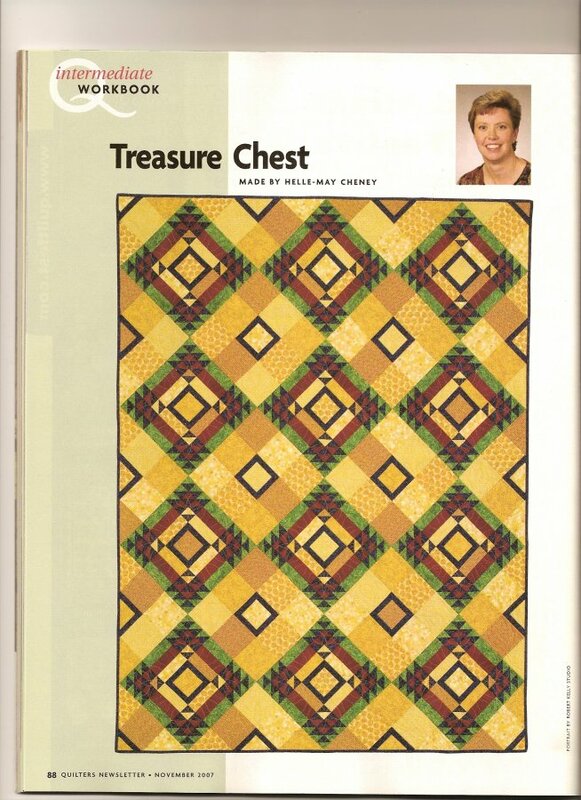 HMD-103 Treasure Chest (57" x 76") is a 2-block, pieced quilt. Each of the two 13 1/2" (finished) main blocks are 9-patch blocks made from pieced and plain 5" squares. I used five different gold fabrics to achieve a scrappy look. The dark blue, red, and green patches are cut from a single fabric of each color. Some would say that this quilt is for intermediate quilters only because of the sheer number of half square triangles required to make (432 to be exact) - but I know that if you're a confident beginner, all you need is a little extra time!. 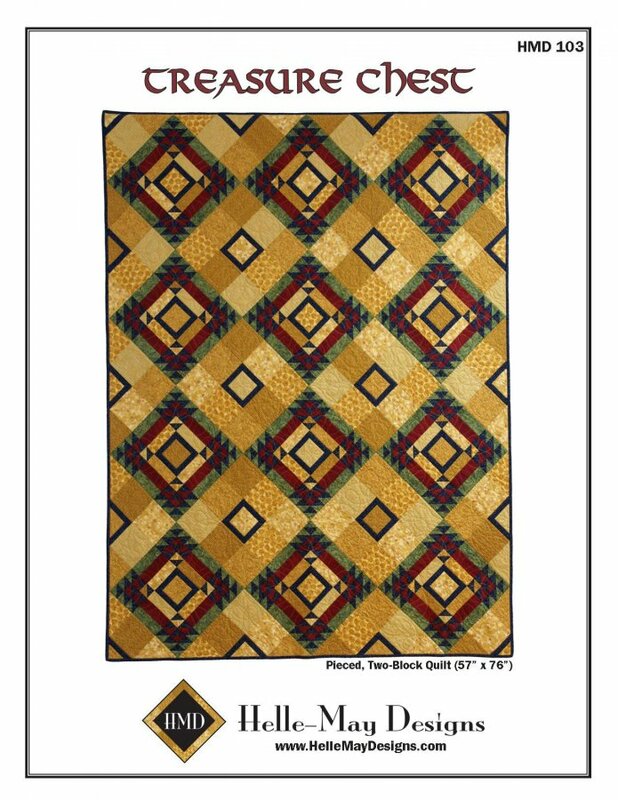 Treasure Chest is the quilt that really launched Helle-May Designs. It has taken on a life of its own, but comes from very humble beginnings! When my second son was born in 2003, my husband bought me a quilt mgazine to read while I was in the hospital, "Better Homes and Garden Quiltsfrom the Century." I had my hands full with a newborn and a 3 year old, but one quilt in the magazine really struck a chord. It was Geometric Puzzle and was a quilt pattern published in 1928 in Succesful Farmer Magazine. I didn't care for the setting or the colors, but I really like dthe block. A year later, I wanted to make my mother in law a quilt for Christmas to go with her newly decorated family room. My mother in law was a math major and an avid puzzle solver, so I thought it would be really fitting to use the Geomtric Puzzle block. I changed the colors, created a new setting and Treasure Chest was born. The name comes from the "gem colors" set against a "gold coin" colored background. On a whim, I asked my husband what he thought about the idea of entering it into the 2005 AQS Nashville exhibit. "What do you have to do? ", he asked. "Send in an entry form with $5.00" "Nothing to lose! "- was his reply. And boy was he right! Not only did Treasure Chest get juried into the Nashville show that year, but it was then also juried into the Quilts, Inc. travelling exhibit, "In the American Tradition" which took it to the 2006 Market and Festival in Houston, Spring Market in Salt Lake City and Quilt Show in Chicago. An image of the quilt was even used in the Class Catalog for Houston Festival that year as well as the cover of the Buyer's Guide for Market in Salt Lake City. 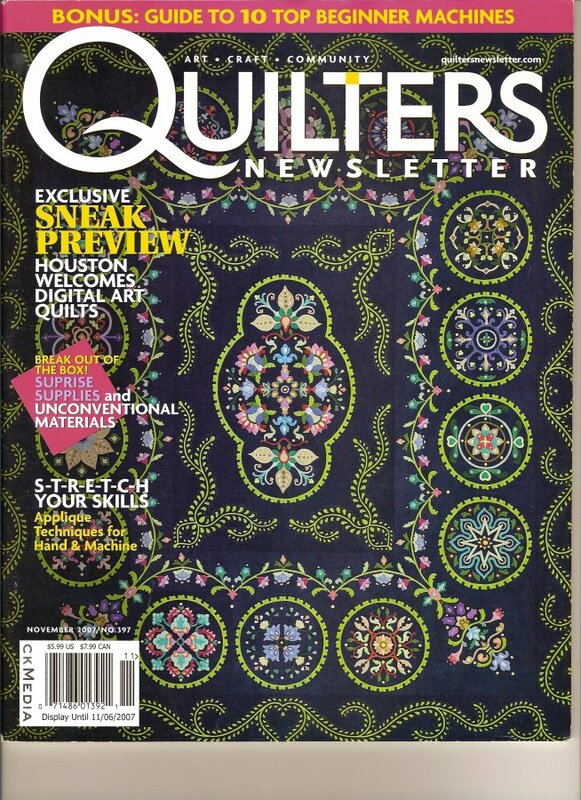 While in Houston, it was noticed by the editors of Quilter's Newsletter, which landed it a spot in their November 2007 issue. I am still floored by the amout of interest this simple quilt has received. Just goes to show - "Don't be afraid to show that quilt - you never know who's looking!" Finally, I am proud to say that despite its notariety, Treasure Chest keeps its pride in check as it serves its intended duty, providing warmth to "nappers" on the family room couch at my mother-in-law's house!